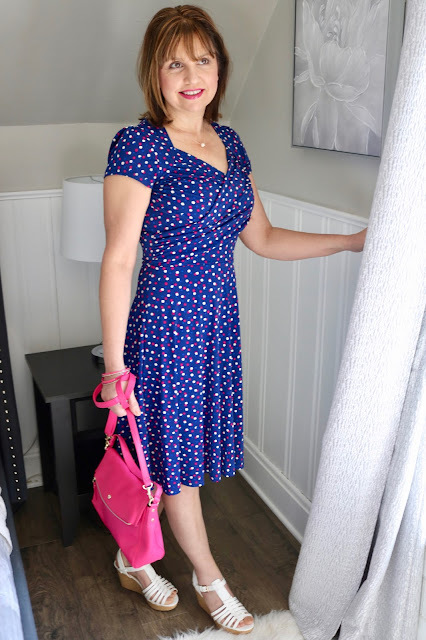 I received this pretty dress in my February Stitch Fix box. It is covered in trendy white, pink, and blue polka dots. It is a soft jersey knit that is very comfortable. It had everything going for it: a perfect fit, comfortable, and a trending print: Polka Dots. Needless to say I kept it! In my February Fix I received two dresses, one top, a vest, and a pair of skinny jeans. I kept three items: both of the dresses and the top. If you're getting confused about my February Fix because I'm only showing one item per post, I will be doing a summary in my last post of my February Fix next Monday. Obviously it's too cold in Wisconsin to wear sandals and go bare-legged yet, so this outfit was put together just for photography purposes. I'm hoping soon I will get to wear this outfit as it is so cute! I picked these cute wedges to pull out the white polka dots in the dress. I purchased them on clearance at the end of the summer season at JCPenney. I haven't even worn them yet. Shoes and coats are great pieces to get great deals at the end of season. I often pick these items up to save for next year. This year I scored big on two new winter coats from JCPenney by waiting till they were 60% off. If you think you need a new winter coat for next year, my advice is buy it now! You'll get a great deal! My favorite feature of this dress was the neckline. I thought the cut around the neck and sleeves was so pretty. I loved the way the material criss-crossed over the bust and was gathered. I also like that the neckline did not plunge. Too many dresses and tops plunge too low requiring me to wear a camisole for modesty. This one has a very nice modest neckline...the perfect dress to wear to church! I wore a simple pearl necklace for jewelry. I felt the polka dots and interesting neckline did not require anything more. 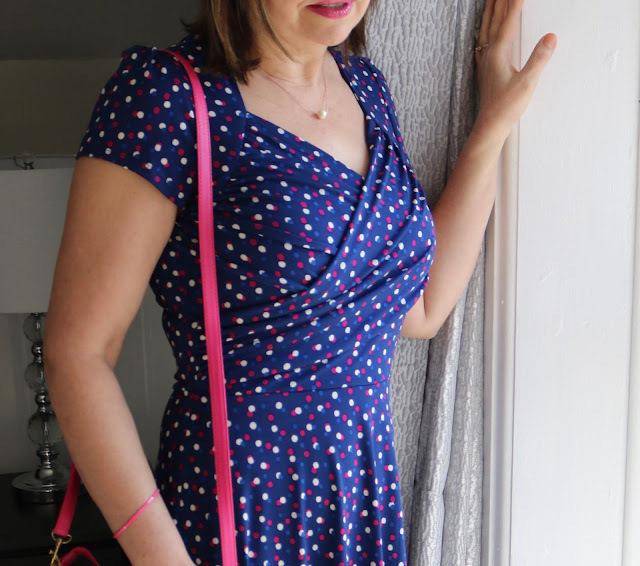 I wore pink and gold bracelets and carried a bright pink cross body bag to echo the pink polka dots in the dress. I was very pleased with the length of this dress. It's so hard to find longer length skirts and dresses for my 5'7 frame. Like I said earlier, the fit on the dress is amazing! It's as if the dress was specifically made for me. Stitch Fix really nailed it with this dress. I couldn't be happier with this dress. I know Stitch Fix can be a frustrating service for some people. I know from experience what it's like to have great Fixes and some bad ones. In fact, for my March Fix, I didn't keep anything and sent everything back! But one thing I will say about Stitch Fix is that they have the best dresses. Dresses are so hard to find in stores these days. Especially dresses like this...more modest with longer lengths. There are lots of short dresses with spaghetti straps out there, but not enough traditional styles like this that are appropriate for work or church. The dress is so comfortable I will be able to wear it for everyday events like shopping, lunch, and travel and not just for church. I love jersey knits! Come back next Monday to see the other dress Stitch Fix sent me in my February Fix which was also a hit! Then I'll conclude that post with a summary of my entire Fix. Thanks so much, I have the feeling it will be in my closet for the rest of my life! It's a classic! very pretty dress, it is definitely a keeper. That dress is so cute on you! I find that Stitch Fix is hit or miss, and I really like shopping, so I decided to just do it myself. Have you tried the Nordstrom one yet? Happy weekend! Thank you, yes, that's so true about Stitch Fix. No, I have not tried Nordstrom yet. Their products tend to be too expensive for me. I love the entire outfit! The dress is fantastic and those shoes are wonderful! Thank you for joining my Fancy Friday link up party! The dress looks great on you Amy. What a perfect fit! This is a beautiful dress! Love the neckline and the different colors of polka dots. This dress looks good on you and love how you styled it! Happy Friday and wishing you a wonderful weekend! That dress fits you perfectly! I love those shoes and it makes me want summer here already! Thanks Ruth! I do to. Would you believe I woke up to snow this morning? UGH! That's a great dress, Amy! You look fabulous! A great fitting and comfortable dress is such a pleasure to wear. I love the sandals with it, too! You are not kidding one bit! That dress looks as if it was custom made for YOU. Love the polka dots and your choice of necklace was perfect. I am on the look out for a little gingham and something polka dotted, too!! Thanks Leslie! It's so rare when something fits me so perfectly; of course it was a keeper! What a fun and happy dress! Polka dots are so cute this year! "fun and happy"; I like that description. thanks so much! That dress is really pretty on Amy. I like how you brought the Pink out wit the bag. Very pretty dress, Amy! I really like the multi colored dots and your pink purse compliments them perfectly. The fit is perfect and So flattering! Lovely polka dot dress dear. The color is really cute on you, the pink bag is such a lovely contrast too. Amy, this is such a flattering dress on you. Love the bright colors and it looks like a Karina trudy dress. The white espadrilles are adorable too, they are my fav style to wear in the summer. Thanks Jess! It does remind me of a Karina dress! OMGosh, Pink, White and Blue, such a cute color combo! I love how you paired it with the white/pink accessories! !